It’s easy to say that you are going to start to exercise but, within a week you probably feel lazy and stop doing it. If you want to keep fit, have a good support system is important and there is an app for that. Let us introduce you PumpUp, a fitness app different than any other, because it inspires you to keep exercising and eating right with the help of strangers creating a great community. Free, is available for Android and iOS. Wake up in the morning is really hard, especially if you need some extra help to get out of bed. If you use your smartphone as an alarm clock, there are apps who make waking up easier. We have a compilation of the best alarm apps for smartphones. You can use a password to avoid other people from using your phone, but always will be a person that can guess it or take advantage of the moments when you are not looking. 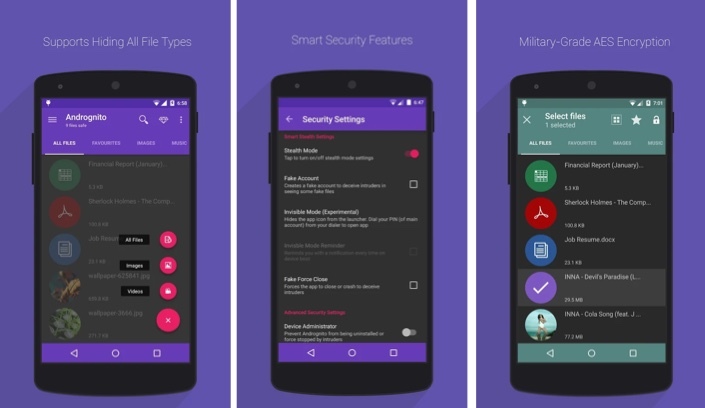 If you want to keep your sensitive files away from intruders, there is an app for that called Andrognito. How many selfies you take every day or week? We´re always looking for the perfect one and if you want to look amazing in yours there is an app that fixes your photo to make you look like a movie star. 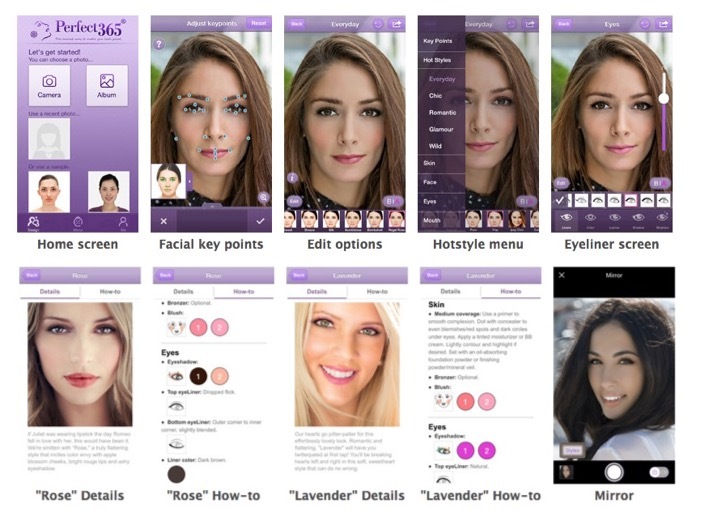 Perfect 365 is an app for smartphones dedicated 100% to fix imperfections in your face and add makeup and retouches. Sounds difficult, but the app is pretty easy to use. It offers several tools, from fixing your wrinkles to add a new hairdo. The internet can be a dangerous place for kids, especially if they grab your phone and look for interesting things by themselves. If your kids love YouTube, there is a way to let them surf the app safely. 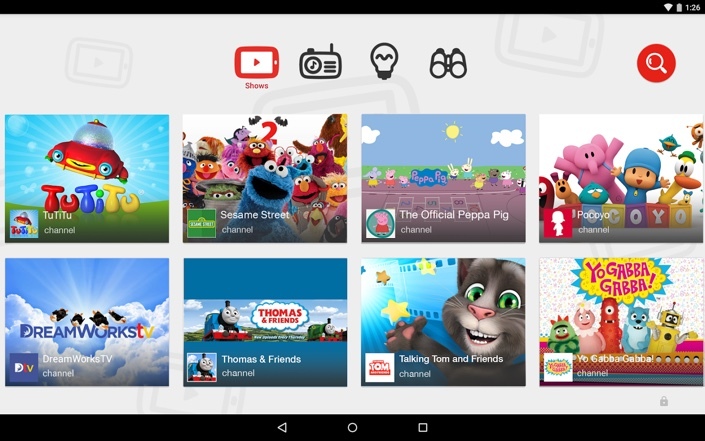 Google presented YouTube for Kids, a YouTube with content for kids and families, even toddlers and preschoolers in a safe environment, because they only can access reviewed videos from the app. Thanks for the great cameras that modern smartphones have, we have become in amateur filmmakers and every especial moment is recorded. 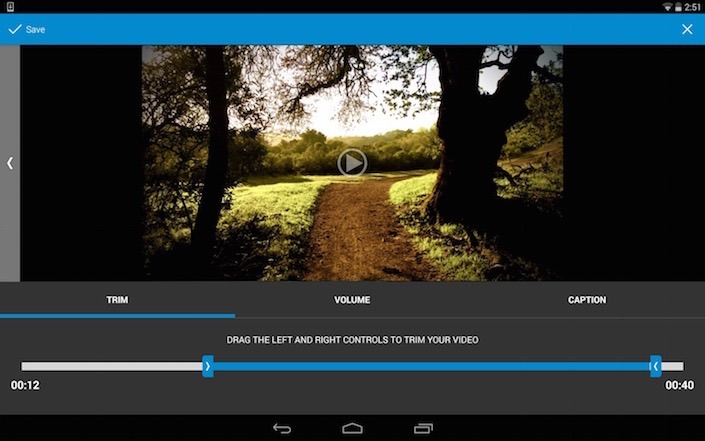 If you want to give an especial plus to your videos, you may need to edit them and, if you have an Android phone, the app WeVide is a good option. GIFs are a great way to share more than a moment inside an image, because you can combine photos or create a small and short video that you can publish as a photography in social networks. 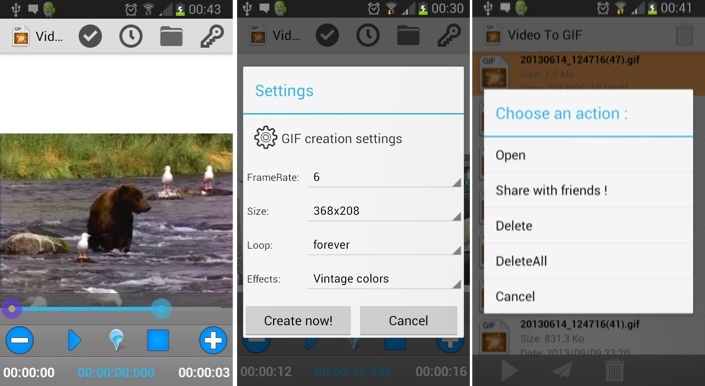 If you want to share a great moment from a video with your friends, you need to try Video to GIF for Android, a free app that lets you convert almost any kind of videos into a GIFs files. Easy to use, is very practical. We love selfies, but this kind of images are not the most flattering, especially group ones, because is difficult to fit a lot of people holding your phone with your hand. 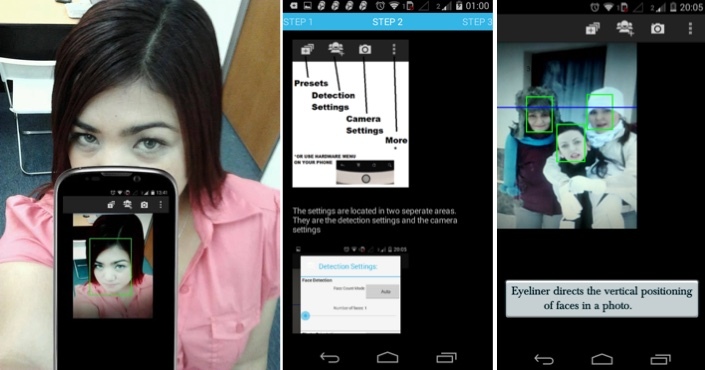 If you have an Android phone, taking selfies will be easier thanks to Smart Selfie, a free app that promises the best selfies without having to use a stick, just following their instructions. If you want to be popular on Instagram, you need to publish several photos every day, separated between hours. You could spend the day uploading images from your phone or let other app to do the work. 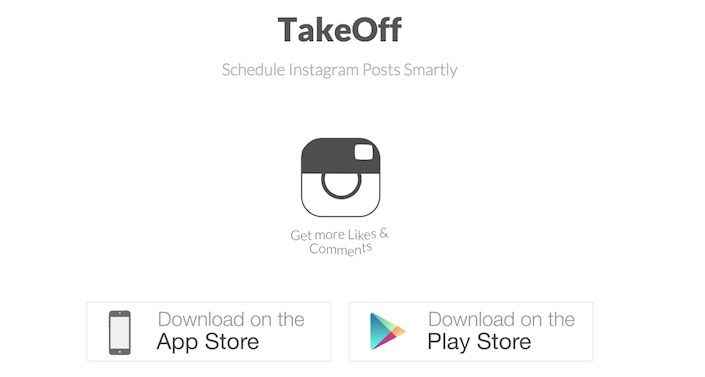 Have you heard about TakeOff, the perfect app for Instagram lovers, because le´s you create a schedule for publications during the day. The app, available for free for Android and iOS, will make easier to win more followers. Twitter is a great place to express ourselves, but, sometimes, we only want to post tweets for a short amount of time. Instead of posting and deleting, there is an app that makes it easier. 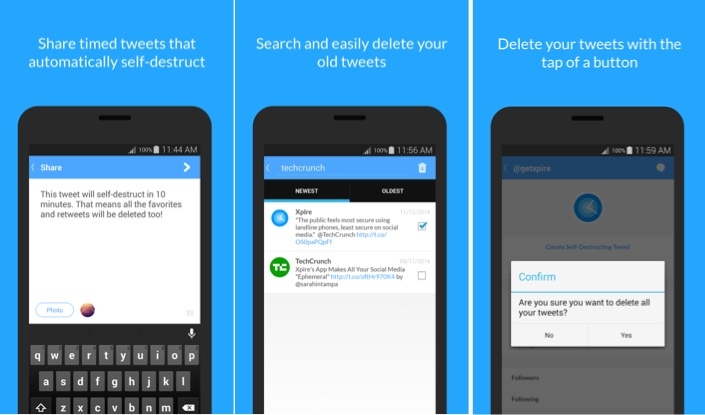 Xpire is an app for Android that lets you create tweets that delete themselves after a period of time. You can set the timer, tweet and then see how your post will be gone at the exact moment of your choice.